A broken six-inch water main that deprived five Arlington, VA houses of water caused enough saturation below a road to sink a fire truck. WUSA9 reported that the apparatus fell into a sinkhole caused by the water leak at around 7 this morning. The Pierce pumper can carry between 500 and 1500 gallons of water, and all up can weight north of 20 tons. 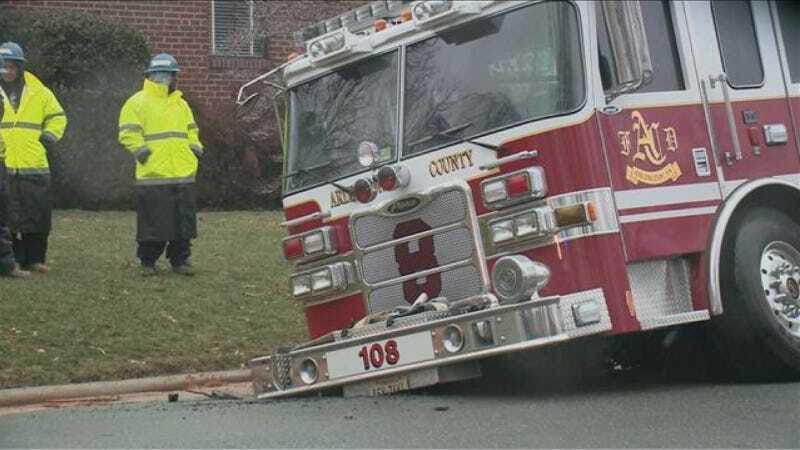 A massive wrecker was required to lift the front of the fire apparatus up by its front recovery points and carry it a few feet to solid ground. The pumper did not appear to be damaged, most are designed to allow for a little flex between the cab and the body. Crews set to fixing the pipe after the truck had been removed.